CEO of Instanbul Entertainment, popularly known as Emanuel “Otunba Cash” Aneke was recently arrested alongside his gang members O. Popoola, AA Oyemade, AT Fajolu and BO Balogun in Turkey for $1.4million scam in Denmark. The company paid money into some accounts in Turkey, and an investigation by Turkish Cybercrime Department led to the arrest of Otunba Cash and his gang members including the Turkish ED, ZI and N.M, whose companies were used as fonts. 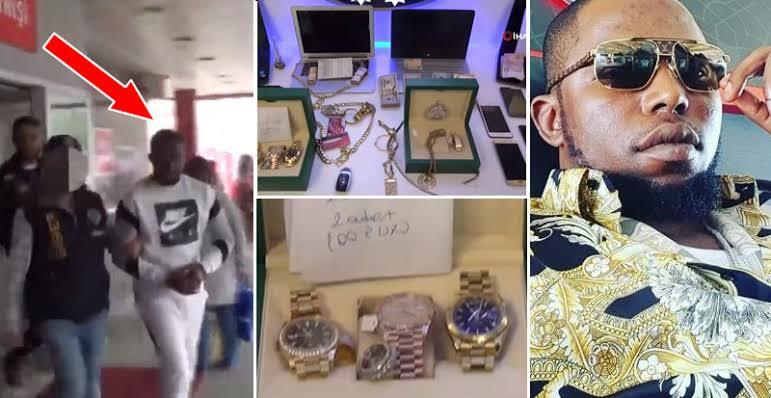 During police raid at their luxury hotel, they confiscated mobile phones, 15 sim cards, 3 flash memory, 4 computers, $85k, €5k, 5 necklaces, 3 bracelets, 2 handcuffs, 2 rings, 1 earring, Rolex watch, numerous crime documents and a luxury car from the Nigerian fraudster.